Igloobooks, the UK’s leading mass-market publisher, is partnering with Aldi to publish two books to accompany the supermarket’s popular Christmas advert. This is the second year that Igloobooks has partnered with Aldi, with last year’s picture book, Kevin and Katie’s Christmas Adventure, proving a runaway success when it hit shelves and becoming the biggest-selling children’s title at Christmas compared like-for-like with sales through Nielsen’s TCM. The two books, based on the supermarket’s much-loved Kevin the Carrot character, will be on sale exclusively through Aldi stores and online. The picture book, Kevin the Carrot and the Christmas Beanstalk, will retail at £2.99 with the Kevin the Carrot Christmas Activity Book, an activity book complete with over 50 stickers, retailing at £2.99. 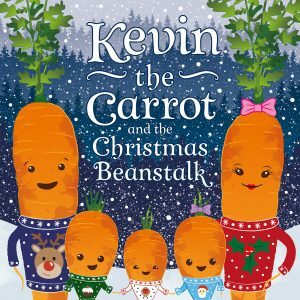 Kevin the Carrot is fast becoming a national treasure and we’re thrilled to be working together to bring this festive fairy-tale inspired story to families everywhere. Illustrated by Nottingham-based artist Adam Horsepool and written by Igloobooks’ in-house writer Stephanie Moss, this year’s story sees Kevin attempt to save Christmas, as the Wicked Parsnip tries to ruin Christmas day for the carrot family. Kevin the Carrot and the Christmas Beanstalk and Kevin the Carrot Christmas Activity Book will be available online and in stores from 22nd November and available to pre-order online from 18th November.